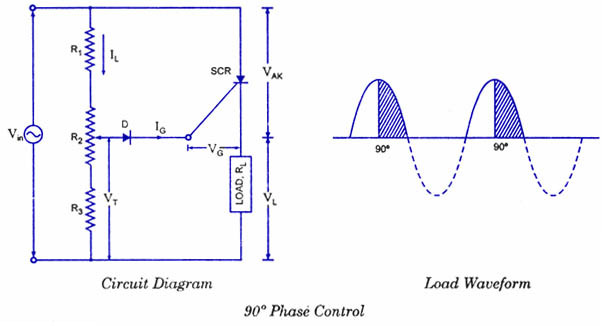 90Â° Phase Control of SCR. In ac circuits, the SCR can be turned on by the gate at anyÂ angle a with respect to the applied voltage. This angle Î± is called the firing angle. PowerÂ control is obtained by varying the firing angle and this is known as phase control.Â In the phase-control circuit given in fig. 1, the gate triggering voltage is derived from the ac supply through resistors R1, R2 and R3. The variable resistance R2 limits the gate current during positive half cycles of the supply. If the moving contact is set to the top of resistor R2, resistance in the circuit is the lowest and the SCR may trigger almost immediately at the commencement of the positive half cycle of the input. If, on the other hand, the moving contact is set to the bottom of resistor R2, resistance in the circuit is maximum, the SCR may not switch on until the peak of the positive half-cycle. By adjustÂ­ing R2 between these two extremes, SCR can be switched on somewhere between the commencement and peak of the positive half-cycle, that is between 0Â° and 90Â°. If the triggerÂ­ing voltage VT is not large enough to trigger SCR at 90Â°, the device will not trigger on at all, because VT has the maximum value at the peak of the input and decreases with the fall in voltage. This operation is sometimes referred to as half-wave variable-resistance phase control. It is an effective method of controlling the load power. The circuit shown in figure, can trigger the SCR from 0Â° to 180Â° of the input waveform. In the circuit shown here, the resistor R and capacitor C determine the point in the input cycle at which the SCR triggers. During the negative half cycle of the input, capacitor C is charged negatively (with the polarity shown in the figure) through diode D2 to the peak of the input voltage because diode D2 is forward-biased. When the peak of the input negative half cycle is passed, diode D2 gets reverse-biased and capacitor C commences to discharge through resistor R. Depending upon the time constant, that is CR, the capacitor C may be almost completely discharged at the commencement of the positive half cycle of the input, or it may retain a partially negative charge until almost 180Â° of positive half cycle has passed. So long as the capacitor C remains negativelyÂ charged, diode D1, is reverse-biased and the gate cannot go positive to trigger the SCR into conduction. Thus R and /or C can be adjusted to affect SCR triggering anywhere from 0Â° to 180Â° of the input ac cycle. 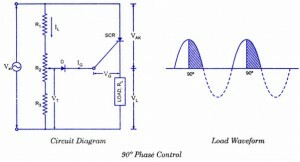 Pulse Control of an SCR. SCR cannot beused for DC motor control effectively! But use L293 or L298 ICs if you are controlling some low power DC motors. In most of the conditions, when you trigger an SCR, you lose control of it. Most of the time, Vt (Or Vak)is constant (Almost). For better concept, get familiar with the terms ‘latching current’ (Related to SCR triggering) and ‘holding current’ (Related to SCR turn off). I am in a quandry. Will the voltage drop across the load cause a variation in the tv? Alsp if i referace the load to the anode are there any issues that i am not considering? sir, i am a student of 5 th sem be electrical , & i want to make one project based on scr application which is easy to making & raliable & also less price contact .. so, kindly sir you will help me for this project. i am very much thankful to you sir..